We are registered with Cumbria County Council and comply with the registered homes act 1984 and the care homes act 2000. All other legislation is upheld including fire, health & safety. 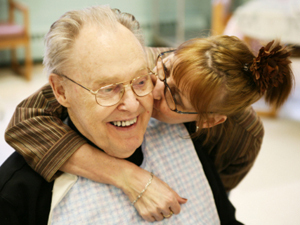 Although we are a residential care home, we also provide an independent day care service. The lady or gentleman may have a bath (if required), two course lunch, tea and beverages and home baking or biscuits throughout the day, and may participate in any activity that may be on offer, all for a very minimal charge. Our cooks offer a varied diet of home cooked food using, where possible, local suppliers, therefore ensuring freshness and quality at all times. Meat is delivered daily and fresh fruit and vegetables as and when required. Hot and cold drinks are available to both residents and visitors. With prior notice visitors are very welcome to join us for lunch. Contact is maintained with doctors, dentists, hospitals etc to enable prompt care and attention to any existing or developing problems. Our staff maintain daily records and care plans for the individual ensuring information is passed on to all relevant parties to provide high standards of care for our residents. Many amenities and services are located within a short walk from the home, including post-office, chemist, doctors surgery, dentist, opticians, bowling green, shops and pubs. Brampton itself boasts an open air market on a Wednesday and churches of all denominations are nearby. We recognise that this home belongs to our residents and we aim to fulfil each individual need. We recommend a visit to our home to fully appreciate what we can offer. Should you require any further information, then please do not hesitate to contact us, we would very much look forward to your visit. So, when you don't know which direction to take, give us a call and head into Brampton! Breakfast - Breakfast is served from 8.00am onwards. Lunch - Lunch is served from 12pm onwards. Tea - Tea is served from 4pm onwards. Supper - Supper is served between 7pm and 8pm. 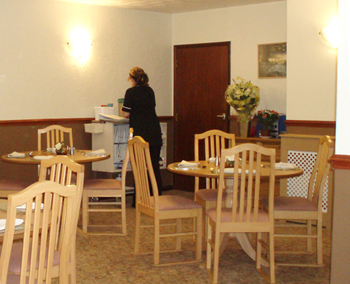 Refreshments / snacks – beveradges, home baking, biscuits etc are offered and available at any time day or night. There is a daily menu with alternative options in order to cater for all diets and tastes. All food is home cooked on the premises. Meals may be taken in the dining room or in the bedroom. Newspapers - Newspapers and Magazines can be delivered at your request, for which there is an additional charge from the local newsagent. Staff will accompany you to purchase one if preferred. There is always a wide range of reading material to suit all readers, many large print for those visually impaired. Laundry - We have a laundry where daily washing will be taken and returned to you over a period of 24 hours. If you wish your family to continue to assist with your personal clothing, please let the manager know and this will be organised. All clothing should be clearly marked with each resident’s name. 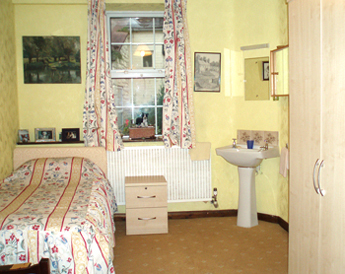 Bedrooms - All bedrooms are decorated and carpeted to a high standard, each has private washing facilities. 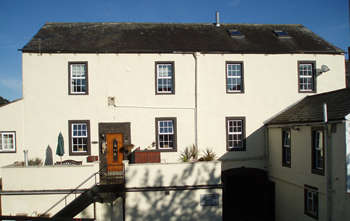 Rooms are available with locking facilities and can be secure when people are away from them. We have a call system in every room, toilet, bathroom and lounges so you can alert staff at any time if you need assistance. We encourage those coming to stay for long periods, to personalise their rooms helped by family and friends, items of personal furniture and bedding, photos, pictures can make a room feel more comfortable and homely. Smoking - Smoking is allowed in the designated area which does not affect non - smokers. Complaints and Procedures - View a copy of Howard Court's Complaints Procedure. Compliments and Procedures - We have a compliments file in the home if you wish to view its contents. If at any time you wish to discuss any aspects of your care or issues around facilities, the Manager will be available to listen to your concerns. An advocacy service will be made available for those who have no representatives to ensure legal rights are protected. Howard Court has a range of activities and social gatherings, available to everyone. All residents are encouraged to join in our social events; this enables everyone to get to know each other and gives a feeling of belonging to the community. We also have a large sun house and patio to sit in, for us all to relax. All religions will be catered for and discussed prior to admissions. Any cultural needs will be addressed in an appropriate sensitive manner on an individual basis. We do occasionally cater for residents with pets so please feel free to enquire if you have a pet that may be suitable to bring into the Home.